Click here for closed captioned video. 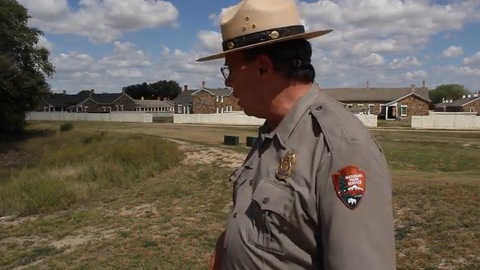 Visitors to Fort Larned National Historic Site have the unique opportunity to tour the nation's best-preserved and best-restored fort from the Indian Wars period. There is a lot to explore and discover at Fort Larned! You can visit with rangers in the Visitor Center to get information about visiting the site. Tour the museum, watch a 10-minute A/V program, and browse the bookstore. Explore the museum's displays of historic artifacts, profiles of notable people at Fort Larned, and information about the fort. When you walk the grounds and tour the historic buildings, you might meet living history staff in period dress who will tell you about life at the fort in the 1860s and 1870s. Ranger-guided tours of the fort may be available; groups must call in advance to make group tour reservations. We offer an advanced Junior Ranger program called Beyond the Brochure for adults who want to continue to learn and earn a badge. Adjacent to the fort buildings, a short, level nature trail winds in a 1/2-mile semicircle around the dry oxbow of the Pawnee Fork. The nature trail offers opportunities to view grassland, woodland, and riparian plants and animals. Fort Larned is on the Central Flyway, a major bird migration route, and can be a great place to observe bird life. Five miles from Fort Larned, you can view a detached portion of Fort Larned NHS that contains historic Santa Fe Trail ruts. For an unforgettable experience, visit Fort Larned NHS on a special event weekend. With help from the site's dedicated volunteers, the fort buzzes with life and activity including living history, weapons demonstrations, and other special activities. Check out our calendar for upcoming events. Most of these old buildings show signs of deterioration, and people have disfigured them further by carving names and initials into the sandstone blocks. The National Park Service works to stabilize the buildings but we need your help to stop other destruction so that future genrations can see the fort as you see it today. Please do not scratch, carve, or mark on walls of buildings. All objects within fort boundaries are protected by the Federal Antiquities Act. It is illegal to disturb, injure or remove any of them.